Believe it or not, George Lucas may have been inspired to create Darth Vader's look by a 19th century rescue mask. The Star Wars franchise has been a popular subject for steampunk adaptation over the years. However, it turns out that at least some of the character designs in George Lucas's universe might have been based on some steampunk-esque technology, based on some gear that a collector has recently put on display. Steve Erenberg, has been a collector of weird industrial artifacts with an emphasis on medical and science devices. However, two of his finds that he's recently put on display definitely look like they're things Lucas himself would have designed ... except they're over a hundred years old. 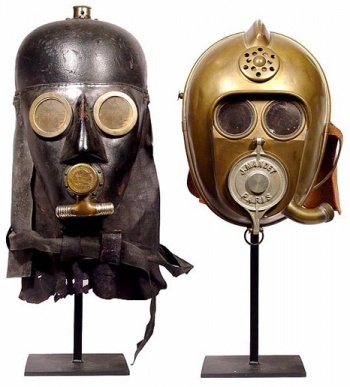 This pair of early rescue masks, shown above, dates from between the mid-1800s and World War I. They look a bit familiar, right? Almost 100 years before Darth Vader and C-3PO hit the big screen in "Star Wars" in 1977, these two smoke helmets were worn by firefighters carrying out rescues in smoke-logged buildings. The buzz among collectors is that George Lucas's designers must have found inspiration in these smoke helmets and others like them. In fact, one well-known 19th-century manufacturer was named Vajen-Bader-you could easily get the name Vader from that. So while this isn't direct evidence that Lucas's designers took their inspiration from some pretty cool antiques, it does seem like a reasonable possibility. After all, these masks are certainly cool-looking, and they do have more than a passing resemblance to both Darth Vader and C-3PO. What do you think? Secret origin revealed, or crazy coincidence?